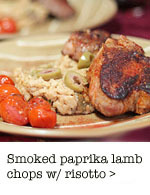 Okay, this is one of those recipes that I saw during the day and went, “OH MY GOD!! !” And then when I got home I immediately made it for dinner. The original recipe is awesome but it’s also one of those recipes that is super-easily adapted to anything you feel like sticking in there. In fact, the first time I made these, I did so as written, except that I just about a tablespoon of defrosted, squeezed-out, chopped spinach per each enchilada for Spinach and Cheese Enchiladas*. 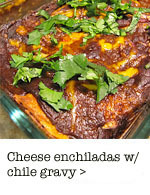 This dish below, however, might just be my new standard enchilada recipe. And, since I plan on making this once a week, I did do a few things to make it a little more once a week friendly. Namely, adding veggies, not frying the tortillas, and decreasing the cheese (!!). Also, and you may certainly not want to do this, but I used a combination of low fat cheese (1/4 cup) for inside the enchiladas, saving the good stuff for on top (3/4 cup). Yes, I know, crazy-talk! But, wow, still so good and I feel a little bit better about eating this how frequently I’m going to eat it. 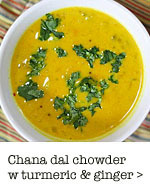 You can see the original recipe at the link below. Oh and I’m pretty sure I will never, ever buy pre-made enchilada sauce again (not that I do that often, sometimes I was just lazy). Adapted from a recipe at Serious Eats. Makes 2 servings. 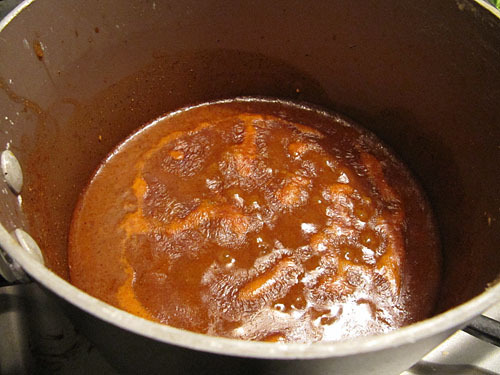 For the chili gravy: Add the oil to a pot and warm it up over medium-high heat. 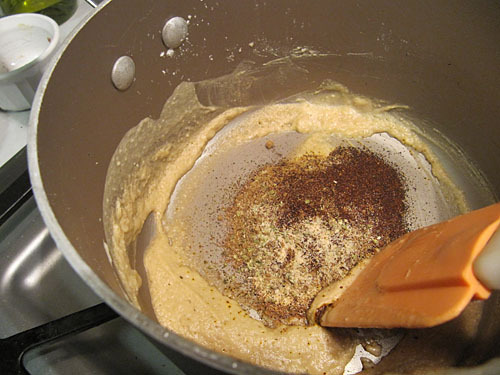 Whisk in the flour and continue stirring until the roux is light brown, about three to four minutes. Add all of the spices, mix well, and let cook for about a minute. Pour in the broth and stir until mixture is smooth. Once it comes to a boil, reduce heat to low to maintain a slow simmer. Cook until thick and rich, about 15 minutes. Taste and adjust salt if needed. 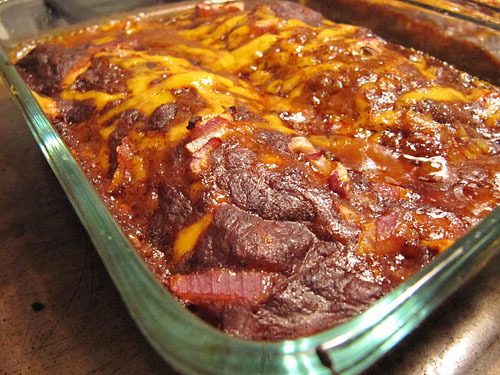 For the enchiladas: Preheat the oven to 425Â°F. Set a small skillet over medium-high heat and let it get really hot. 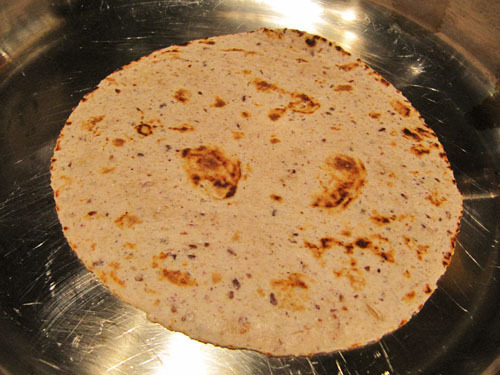 Toast the tortillas until a little brown and puffed in spots. Set aside. 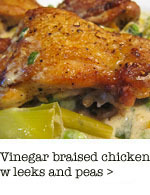 Give the skillet a minute or two to cool down and return to medium-low heat. Add the oil and saute the veggies until a little soft, about 3-4 minutes, giving them a little sprinkle of salt and pepper. 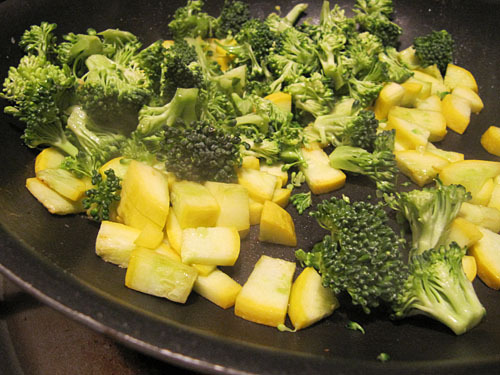 You can also just use another pan for this if you want to cook the veggies simultaneously. 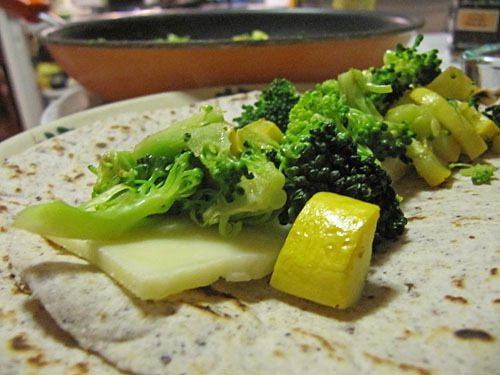 Take a tortilla and add about a tablespoon of cheese, 1/4 of the veggies and roll it up. 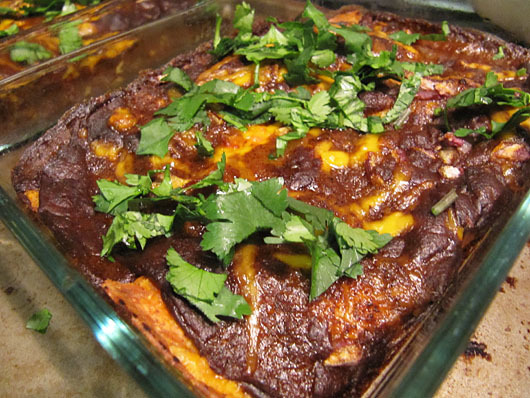 Place seam side down in a small baking dish (either one large enough to fit all four or you can use two smaller baking dishes, with two enchiladas each). Repeat with each tortilla. 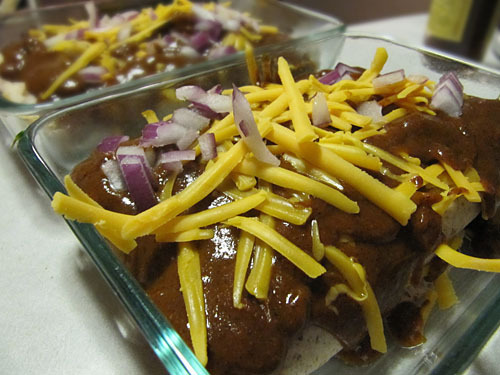 Top with the chili gravy, the remaining cheese, and the chopped red onions. Transfer the baking dish(es) to the oven and bake until the sauce is bubbling and the cheese has completely melted, about 20 – 25 minutes. Garnish with chopped cilantro and they’re ready to eat right away or let cool and wrap up to take for lunch the next day, along with some sour cream (or low fat Greek yogurt). * For these I defrosted about 2 cups of frozen spinach, squeezed out all the water, and had about a 1/4 cup of spinach that I divided among the four tortillas. Isn’t this sauce the best? I had to make it immediately after reading the recipe, too! Ngoc: I know! 🙂 This has become a once-a-week staple in our house! I was looking for some warm comfort food to make last night because it was so cold and snowy, and found this amazing recipe! The chili gravy is amazing! I added some cooked chicken breast to a veggie mixture of what I had on hand: zucchini, onion, green pepper. Thank you so much Michelle! 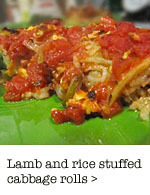 I always look to your blog for great reading and recipes! Yes, this recipe is seriously good. I’ve consistently made the chili gravy at least once a month since posting it. My newest thing is to turn it into a very lazy and not-at-all-authentic quick mole sauce by adding a little cinnamon with the spices and a handful of bittersweet chocolate chips while it’s simmering, and then have that over chicken.